I knew even before I had opened the tin that Scruff Stuff ‘Chocolate Mint’ Beard Balm would be amazing. How? Well having used the six Scruff Stuff Oils and knowing the care and attention to detail that James pays to his products, it was obvious. He would not release a product unless it was perfect and it is perfect! My wife walked into the bedroom and asked “are you eating a mint?”, I wasn’t but I had just applied some ‘Chocolate Mint’ beard balm. James describes the balm as “a rich chocolate scent of natural cocoa butter with just a touch of peppermint essential oil” but the initial scent is that of the Extra Strong mints, then it mellows to a subtle Chocolate Mint! I always mention how the balm feels in the tin, but now that we are getting lower temperatures, I have realised that this can vary on what time of the year I am testing. I did expect a soft mixture but when I went to plunge my finger into the tin, it was met with a hard surface. Personally this doesn’t bother me and as the temperatures get lower many balms and waxes will be the same, I use a metal comb to scrape a little off and it quickly warms in my palms! Scruff Stuff ‘Chocolate Mint’ Beard Balm is a blend of Cocoa Butter, Beeswax, Jojoba oil and Grapeseed oil with the essential oils added to give it the scent. It works easily into the beard and through onto the skin underneath and gave my beard a decent amount of hold whilst leaving it still feeling naturally soft. When applied the mint gives a fresh feeling to your skin and the balm left my beard looking really good. I personally favour a balm now that my beard is longer, it’s a messy beard and so a balm keeps it looking just that little bit better. Of course as with an oil its important to work the balm down onto the skin under your beard, this will help prevent dry skin and that itchy feeling. Also your beard will be protected from the colder harsh winter weather with a good product! 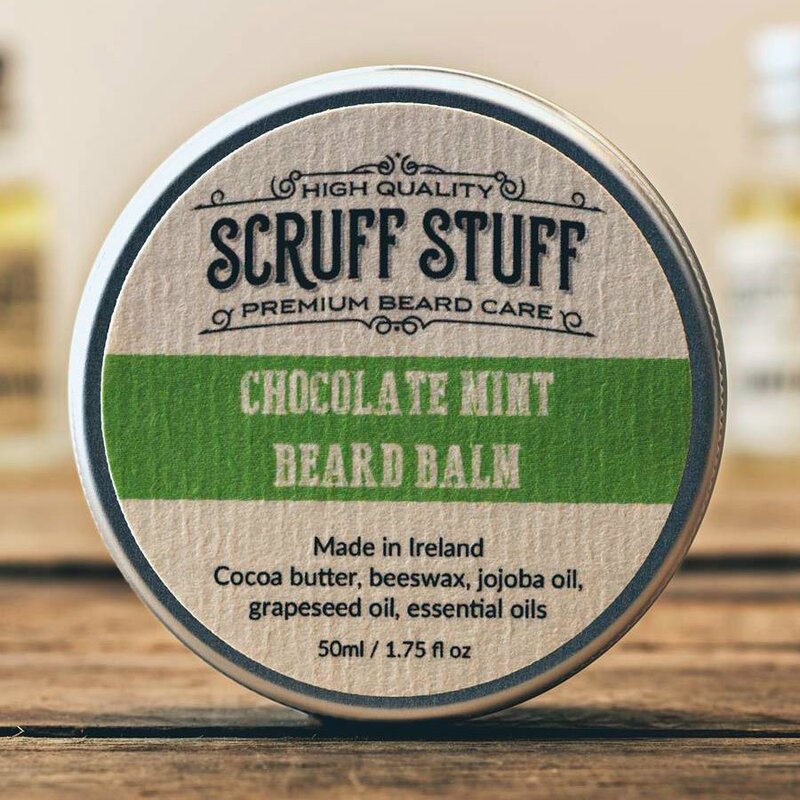 Scruff Stuff ‘Chocolate Mint’ Beard Balm is available from the Scruff Stuff website and the 50ml/1.75 fl.oz tin costs £12.95 but be quick because these balms don’t stay in stock long, Scruff Stuff is a popular brand for obvious reasons. Oh and don’t forget to check out the beard oils, in my opinion James is No1 when it comes to blending the essential oils that give an oil its scent, his oils are so deep and perfectly balanced. I can also guarantee that the Scruff Stuff customer service is as good as the products!